We tried the size Medium in this jacket on Huey and we put an XL jacket on Dewey. These are the sizes they normally wear and both fit very well. Finding a fit in this style won’t be difficult. The overall style is simple and the jacket is fairly relaxed in fit. I’d advise you choose the size you normally wear in men’s clothing. 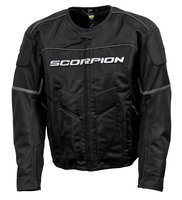 Here’s a great closeout deal on mesh jacket for summer! I measured and tried on some of these jackets and I really like the overall fit and style. The jacket is just so easy to slip on and off, and being a summer jacket, it doesn’t have a lot of complicating factors for the fit such as bulky liners, etc. The entire outer shell of the jacket is flow through mesh except for the crash susceptible areas like the shoulders and elbows, which are a solid textile to add more abrasion protection. The armor in the jacket is of medium thickness and very pliable so I found it to be very comfortable.